Sample Selection: To maintain consistency with the longitudinal data, we surveyed the same list of 32 universities and four national research centers as previous data collection efforts. The 2013 survey also included three new research institutes and eight new universities, to increase the sample size and correct oversights in the initial choice of institutions. (For example, the Universities of Hawaii, Michigan, and Florida and a number of other prominent institutions are not included in the historical data). The new institutions were chosen partly to include the institutions for which CSWA has been tracking the fraction of tenured women  and partly to complete the list of institutions that offer a PhD in astronomy. Table 1S (supplemental on-line material)  lists the institutions surveyed and the years for which we have data. In the analysis described below, the new institutions are included in the 2013 snapshot data, to provide a better representation of the field as a whole, while the longitudinal analysis includes only the institutions that participated in all the surveys. Survey Design: The survey is very simple. Department chairs or administrators are asked to tally the number of men, women, and non-gender-binary astronomers at each level in their department, including graduate students, postdocs, assistant professors, associate professors, and full professors (with an option for “research equivalent” for the latter three categories). In combined physics and astronomy departments, the chair or administrator who completes the survey is asked to include numbers for astronomy personnel only. The decision about whom to include as astronomy personnel was made by individual department chairs, occasionally in consultation with CSWA members. The 2013 survey included a few new questions: for the first time, we asked about the tenure status of faculty, the number of faculty with current administrative appointments, and the number of full-time and part-time adjunct faculty. The specific wording of the questions is given in Table 2S . Several of the non-academic institutions pointed out to us that their staff hierarchy does not fit neatly into the categories provided by the survey (assistant, associate, full professor). The 2013 categories were constrained to be identical to the previous surveys, in order to maintain consistency in the longitudinal results, but upon request we consulted with staff at the non-academic institutions about how best to align their staff hierarchy with the categories in the table. Figure 1 shows the fractional representation of women at all levels as of January 1, 2013 (including administrators and adjuncts). The raw numbers of men and women at each level are also indicated. The fraction of women decreases monotonically with seniority in the field, as expected due to the historic underrepresentation of women in the physical sciences. The exception is the adjunct faculty level, which does not fit neatly into the academic hierarchy and appears to be more male-dominated than expected for astronomers at similar career stages. The representation of women in administrative appointments is commensurate with their broader representation at the full professor level. Figures 2 and 3 are snapshots of how women (Fig. 2) and men (Fig. 3) are distributed across seniority levels in each of the four surveys. It is immediately clear that women are still on average far more junior compared to their male counterparts: roughly three quarters of women are junior (i.e., at the graduate or postdoctoral level) while men are more evenly split between junior and senior (typically tenure-track) ranks. Since most astronomers are still men, Fig. 3 better reflects broader demographic trends in the field as a whole. Several general trends are apparent: in the past decade, the field has been skewing younger as the number of faculty jobs decreases and the number of graduate students increases. The assistant professor level has been particularly squeezed in the 2013 survey, with now roughly half as many positions as at the turn of the century. The more stable numbers for women in Fig. 2 reflect the fact that, even as women have increased their fractional representation at each level, the raw number of positions available has decreased, resulting in only modest (if any) numerical gains at the faculty level over the past ten years. 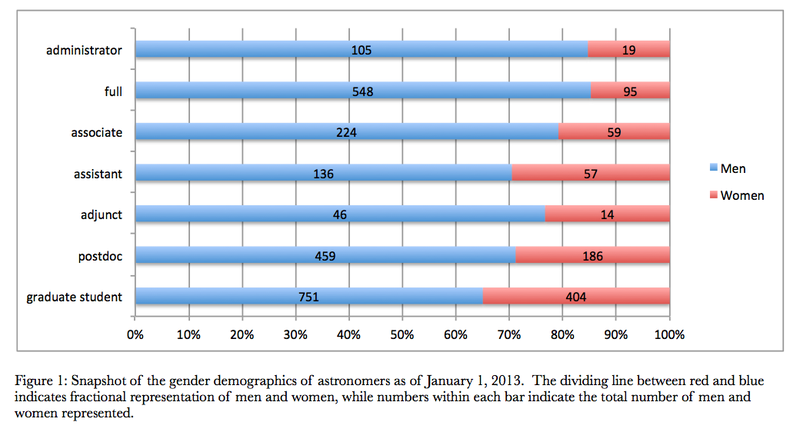 Table 1 provides the percentage of female astronomers by rank in each of the four surveys. The fraction of women at each stage has been steadily increasing over the past 20 years. A particularly substantial increase has occurred at the assistant professor level: the fractional representation of women increased by 50% in the past 10 years, rising from 17 to 26 percent. 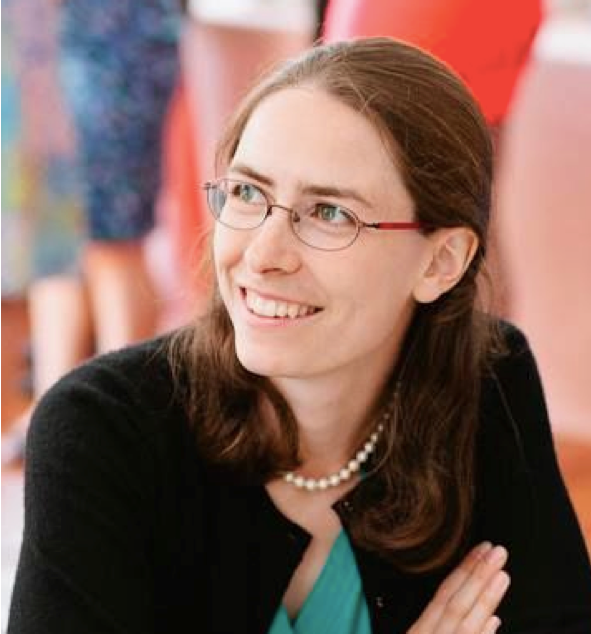 The fact that the assistant professor level now approaches (and is in fact statistically indistinguishable from) the 30% mark is notable in part because data collected by the Astro2010 DEM study group shows that for almost 20 years, approximately 30% of the prize postdoctoral fellowships in astronomy have gone to women (Schmelz et al. 2010) . The fraction of female assistant professors now seems to be approaching the fraction of female prize postdocs, a healthy sign that the transition from postdoc to faculty position is now approaching gender equality. To pursue this hypothesis, we turn to a survival analysis of men and women over each of the two decades sampled by this series of surveys. 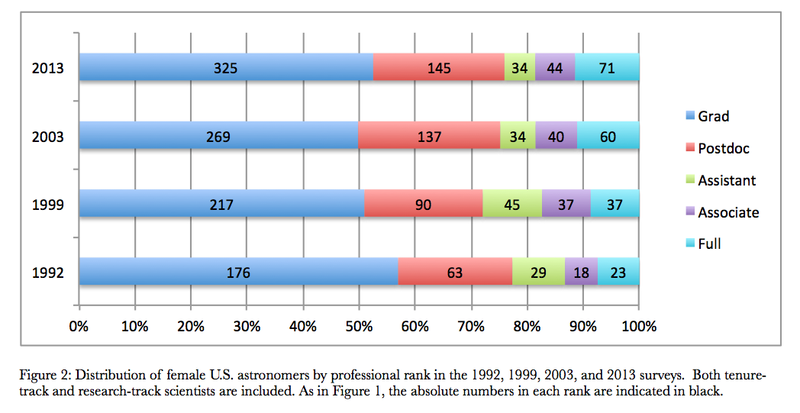 Table 1: Percentage of US astronomers who are women, by rank. "Professor" positions are broken down into three categories: total (all data combined), faculty-track, and research equivalent. Table 2 compares the fractional representation of women at the graduate and the assistant professor levels in two sets of snapshots each separated by ten years. These two levels provide a particularly robust comparison, since the duration of the two career stages are comparable (5-7 years on average), and the elapsed time difference between the average graduate student and the average assistant professor is approximately ten years. For example, to investigate the fractional advancement of men between stages, we compare the number of male graduate students in 1992 to the number of male assistant professors in 2003 and calculate the fraction that advanced between these career stages over the course of a decade. We then perform the same calculation for female graduate students in 1992 and female assistant professors in 2003 and compare the resulting percentage. If women are being promoted and retained at rates comparable to men, then the fraction that advances to the next career stage should be equal for the two groups. We compare the 1992-2003 decade to the 2003-2013 decade to look for changes in the fractional advancement of the two groups. We also make the comparison for postdoctoral and associate professor cohorts in the two decades. More caution should be applied in this comparison, since the duration and elapsed time between the two stages vary far more than for the graduate and assistant professor levels. However, while the absolute values of the fraction of each cohort that advances should be treated with caution, differences between men and women are likely to be robust. Table 2: Survival analysis of men and women over the two decades of the surveys. Perhaps the most encouraging result of the survey is that the gap in advancement for women at the graduate student to professor transition is closing. Between 1992 and 2003, (30±3)% of male graduate students advanced to the assistant professor level, while only (18±3)% of female graduate students did (errors are from Poisson counting statistics). In the most recent decade, by contrast, the difference narrowed to become statistically indistinguishable: (19±2)% of male graduate students advanced while (16±3)% of female graduate students did. Of course, the immediately striking trend is that the fractions have decreased for both genders over the past two decades: the job market is bad for everyone. The bottom line: while there is certainly no preference for hiring female assistant professors, the fraction of women that advances from the graduate to the assistant professor level has in the last ten years reached a rate that is statistically indistinguishable from that of their male peers. One of the crucial transitions in the life cycle of an astronomer is from the (typically) pre-tenure assistant professor level to the (typically) tenured associate professor level. In Table 1 and Table 2, one of the most interesting trends is at the associate professor level. The fraction of female associate professors has not budged in the last 10 years: it has been (20±4)% since 2003. As Table 2 indicates, much of that low fraction can be explained by historically low rates of female postdocs: 17% among the 1992 postdoctoral cohort (and those female postdocs are the ones who filled the 2003 associate professor pipeline), and 20% in 2003 (and those are the postdocs that filled the current associate professor pipeline). Due to the small numbers of individuals involved, the percentage advancement from the postdoc level to the associate professor level over these 10- year timescales are the most uncertain numbers in our table, so it is difficult to determine whether the persistently low fraction of associate professors is due to lack of advancement, or simply lack of supply. But in the meantime, the fraction of women at the postdoctoral level has skyrocketed, providing adequate supply to substantially boost the number of associate professors in the next decade. These data predict that, by 2023, women should make up nearly 30% of the associate professoriate. Future surveys should monitor this trend to decide whether women are leaking from the pipeline at the crucial pre-tenure to tenure transition. In addition to trends across the field as a whole, the survey data allow us to investigate similarities and differences between institutions. Figure 4 plots the fraction of female faculty (on the left) and students and postdocs (on the right) as a function of each individual university’s 2010 National Research Council (NRC) ranking. The methodology of assigning NRC rankings changed substantially in 2010, making it difficult to compare institutions’ rankings over the two decades of the survey; furthermore, because the NRC now ranks according to several different sets of criteria, there is no single number to compare with each institution’s demographic data. For simplicity, we therefore chose to average the high and low range of each institution’s 2010 R- Rank (based on research productivity metrics) to gauge its preeminence in astronomy research. The writeup of the 2004 CSWA demographics survey reports no correlation between the fraction of women at each institution and its NRC ranking, and indeed we do not observe much of a trend in the 2003 data. In the most recent data, however, a correlation has developed between the fraction of women and the most recent NRC ranking of the institution: the higher-ranked the institution (indicated by a smaller numerical R-rank), the fewer women it tends to have at both the graduate student and faculty level. The difference has significantly intensified over the past decade, indicating that higher-ranked institutions have on average been slower to promote and retain women than their mid- to low-ranked counterparts. Nor is the trend simply a matter of department size: smaller departments are not more likely than larger departments to have a greater-than-average fraction of women. The “average” lines in Fig. 4 represent the total number of female faculty (or students and postdocs) across all institutions, divided by the total number of faculty (or students and postdocs) represented by the survey. The 2013 plots include all of the universities for which we collected data in 2013 (see Table 1S). Furthermore, the 2013 data show that, as the representation of women in a department increases at one level, it tends to increase at other levels as well – and over the past 10 years departments have become more polarized in their representation of women. This trend is evident in Figure 5, which shows the fraction of female faculty vs. the fraction of female students and postdocs in a department. In 2003, there was no trend relating the fraction of female faculty to the fraction of female students and postdocs, but, over the past decade, such a trend has emerged in the data. While it is impossible to discern cause and effect from the simple data collected for our survey, it seems probable that whatever departments are doing (or not doing) to actively recruit, support, and retain women at one level is affecting women at other levels as well. Perhaps, with the increased number of women at all levels, it is more obvious when a department is particularly supportive or unsupportive, and therefore departments are becoming more polarized as women vote with their feet. Whatever the cause, this trend is both encouraging – in the sense that some departments have reached gender parity – and distressing, in that we see more extreme outliers at the low end of the distribution as well. The increasing range in representation of women is well illustrated by the histories of two institutions that, in 1992, were similar in size, NRC rank, and representation of women. One of them has been gradually but steadily hiring and promoting women. In conjunction with strong growth in total faculty size between 2003 and 2013, it has reached gender parity. The other, while hiring and promoting at least four male faculty members since 2003, now has no women in its 18-person program at any level. The 2013 CSWA survey suffered from many of the same limitations as the 2003 survey: it was difficult to standardize the ranks of the professoriate, particularly at non-academic institutions, and it was not clear whether consistent criteria for sorting employees were applied over the two decades of the survey. In the field of astronomy, small number statistics are always problematic, particularly at the faculty level. However, the relative uniformity of method, the consistent participation of a majority of the largest astronomical institutions, and in particular the long time baseline of this survey provide a reasonably robust overview of how the representation of women in astronomy has evolved over the last two decades. We urge CSWA to continue conducting this survey at least once per decade: in particular, the 2023 survey will be critical for monitoring the all-important pre- tenure to tenure transition and determining whether women are disproportionately leaking from the pipeline at this stage. The 2013 survey demonstrates that, for the first time, enough women have advanced to the postdoctoral and assistant professor levels to provide meaningful statistics for the transition to associate professor. Here is a summary of our most important findings. Good news: In the last decade, universities have on average been recruiting and retaining women into assistant professor positions at rates approximately consistent with (but no greater than) their representation at junior levels. Morally ambiguous news: In the last decade, there is evidence that the currently highest-ranked institutions (according to the NRC R-Rank) have been slower to recruit, promote, and retain women than mid- to lower-ranked institutions. The research track is still more male-dominated than the tenure track. Unfortunate news: Departments have become more polarized in their recruitment and retention of women, with increasing numbers at the extremes of high and low fraction of female faculty, students, and postdocs. We therefore encourage interested parties to take action at the department level. A PDF presentation containing the key figures, tables, and text is available on the CSWA website  and we encourage broad dissemination and discussion. Portrait of a Decade: Results from the 2003 CSWA Survey of Women in Astronomy, Jennifer L. Hoffman and Meg Urry, June 2004 Status. Senior Women: A Comparison of Astronomy Organizations, Joan Schmelz. Schmelz, J., Brickhouse, N., Norman, D., Ulvestad, J., Bruff, S., and Barker, N. 2010, “The 30% Benchmark: Women in Astronomy Postdocs at US Institutions,” in Women in Astronomy and Space Science: Meeting the Challenges of an Increasingly Diverse Workforce, Proceedings from the conference held at The Inn and Conference Center University of Maryland University College October 21—23, 2009, eds. A. L. Kinney, D. Khachadourian, P. S. Millar, and C. N. Hartman, p. 234. CSWA Town Hall: Portrait of a Generation of Women in Astronomy.